John Martin's tribute to his hero, Billy Liddell, which was first published at LFChistory.net. In the period that followed the Second World War life in the UK was pretty austere. Rationing, something that is barely imaginable today, was widespread. We were only allowed to buy very limited amounts of the things that we all needed. Eggs were restricted to two per person per week, bread to a couple of 2lb loaves and milk to a couple of pints. We got by but it wasn’t pleasant. I was 6 when the war finished and, because there had been no meaningful football during the war, I had no allegiance to either of the city’s clubs. However we lived adjacent to Newsham Park which is about one mile, as the crow flies, from Anfield and I spent all of my leisure time there, playing cricket in the summer and football in the winter. When league football got going again after the end of the war Saturday afternoons in Newsham Park were punctuated by what sounded like claps of thunder but were, in fact, the sounds of the Kop celebrating another goal for Liverpool. We won that first post war Championship and although only two of the ‘thunderclaps’ I had heard in Newsham Park were to celebrate goals by Billy Liddell I had become a Liverpool supporter and I was desperate to go to Anfield to see my team play. Billy had become my hero as a result of the reports in the ‘Echo’ which described his terrific pace and cannonball shooting power. I was not to know that the 1947 Championship triumph was a peak from which we were to fall at a pretty alarming rate over the next 6 years. Billy could do no wrong as far as I was concerned and he continued to score and supply goals even though the team was slowly subsiding. I didn’t have too long to wait for my first game at Anfield. I had an uncle who was well connected and, for my 10th birthday present he took me to Anfield to watch the Reds play Burnley. That would have been good enough had we had the worst view in the ground but the actuality was that we watched the game from the splendour of the directors box! My uncle’s connections included one of the club’s directors, Mr Martindale, and I took my place to watch Liverpool play Burnley on 4th December 1948 sitting next to Ted Ray who was, at the time, probably the top comedian in Britain and a huge radio star at a time when TV was yet to be available. My world was shattered when Burnley scored and at half time I was convinced that my first live game of football was destined to end in defeat. The half time break was to have a huge influence on the rest of my life. When the referee blew his whistle for half time all of the inhabitants of the directors box headed for the boardroom for refreshment (mainly of the alcoholic variety) but because of my tender years I was not allowed inside and I spent the 10 minute interval in the company of the commissionaire who was on duty outside the boardroom. Eventually a buzzer sounded and the commissionaire popped his head inside the boardroom and announced ‘teams coming out, gentlemen’. I can still hear the clatter of studs on the concrete surface that separated the dressing rooms from the tunnel onto the pitch and there, only a few feet away from me, were my heroes making their way back onto the pitch for the second half. Talk about being starstruck! I only had eyes for Billy Liddell and as he passed he obviously picked up my open mouthed adulation and he winked at me on his way to the pitch. What a birthday present this was turning out to be! When we took our seats for the second half I was in wonderland but I was still convinced that we were about to be beaten until Cyril Done scored with 10 minutes to play. The game ended 1-1 and I was well and truly hooked on Liverpool FC in general and William Beveridge Liddell in particular. 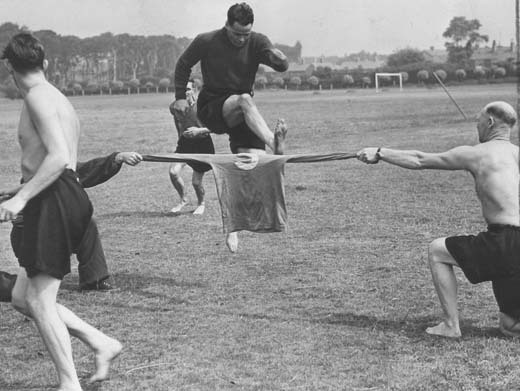 Billy Liddell was everything that a professional sportsman should be. He was supremely talented at his sport, he was scrupulously fair in the way he played, he was loyal to his club and their supporters and he was an inspiration to a whole generation of youngsters, of whom I am proud to be one, in the way they were to lead their lives. Few performers in any sport get to be known only by their Christian name. Many are accorded affectionate nicknames, Rushie, Carra, Stevie G, Cally, Smithy and Thommo coming readily to mind but I can only recall three who have been universally referred to by their Christian name and instantly recognised. Billy (Liddell), Kenny (Dalglish) and Dixie (Dean). During his playing career you never heard any Liverpool supporter ever refer to ‘Liddell’. Even if he missed a penalty, which he did occasionally, it was always ‘Billy missed’ not ‘Liddell missed’. His ability is difficult to relate to any modern day players. He was completely two footed, to such an extent that his natural foot was his right one, and yet he made his name as a left winger. He could head a ball more powerfully than many could kick it and his speed was such that he would have been a match for Michael Owen at his peak. He played in the era of the maximum wage and actually earned less than some of his team mates because he was only a part time player. He combined his football career with a life as an accountant and a bursar at Liverpool University, not to mention his responsibilities as a JP. But it was as a raiding winger that Billy will best be remembered. To watch from the main stand as Billy attacked the Kop goal was a sight to behold. In those days the Kop was reputed to hold 28000 spectators and when Billy got the ball they all wanted to see what he was going to do with it. The surge forward was spectacular but, in the aftermath of Hillsborough, was extremely dangerous. It was commonplace to move 20 yards from your starting place in the Kop when there was a full house and Billy’s charges down the wing could well have pre empted what happened at Hillsborough. And still there are some who want to reintroduce standing areas!! Having seen Billy for the first time live I was desperate to go back to Anfield to see my heroes on every possible occasion but my folks would not let me go to the match unattended for the rest of that season and I had to wait for the beginning of the 1949/50 season before I was able to reacquaint myself with the thrill of attending Anfield. The first game of that season was against Sunderland, a big club in those days, and I was allowed to go to the game on my own on the understanding that I went into the boy’s pen. This I was more than happy to do and it was from the boy’s pen that I watched my beloved Reds for the next few years. Had my parents known of the unspeakable discomforts in that little concrete box in the top corner of The Kop I doubt that they would have let me anywhere near Anfield!! The behaviour of most of the occupants was appalling and most of the bigger boys climbed onto the wall of the pen and jumped into the Kop. As I was about 4ft 6” at the time this was not an option for me and so the ‘Pen’ became my Anfield home for the next 4 years or so. That game against Sunderland resulted in a comfortable 4-2 victory but my hero, Billy, missed a penalty. He hit the ball to the goalkeeper’s right but put it wide of the post and it hit the low wall that surrounded the pitch in those days and rebounded onto the track just by the half-way line on the Kemlyn Road side (now the Centenary Stand side). I imagine that the Sunderland goalie was glad that he was unable to get a hand to it! My disappointment at the missed penalty was soon forgotten as I attended ensuing games and Billy kept supplying goals for the likes of Albert Stubbins and Jack Balmer. This was the season that we got to the FA Cup Final and Billy, of course, made a huge contribution to the Cup run. When the draw was made for the quarter finals we were drawn against Blackpool who, strange as it might now seem, were a big club at the time and they had as their star player one of English football’s all-time greats, Stanley Matthews. Stan was later to be knighted by Her Majesty but had Princess Elizabeth, as she was at the time, been present at Anfield on 4th March 1950 she would certainly have been more impressed by Billy’s contribution than by the future Sir Stanley. I watched this game from the Kemlyn Road Stand with my father (the only game I ever attended with my dear old dad) and the tickets must have been obtained via my uncle’s contact with Mr Martindale. We won the game 2-1 with the winning goal coming from, who else but Billy. The game was memorable for me for all sorts of reasons. It was the first game that I had attended with my dad (and, as it happens, the last), my hero scored the winning goal and our trip to the ground was taken by taxi. It was my first taxi journey and the driver told us that his last fare had been Stanley Mattews, who he had taken from Lime Street Station to Anfield. That might or might not have been true but I certainly remember the game for another reason. Liverpool made a radical tactical change, which sounds pathetic in these days of ever changing line ups. The Liverpool team was announced in its usual formation with Jimmy Payne as outside right and Billy Liddell as outside left but when the game kicked off Payne and Liddell swapped wings and Billy played on the right and Payne on the left. Believe it or not but that tactical revolution was seen as the crucial part of Liverpool’s victory. We beat Everton in the semi final at Maine Road and went on to lose to Arsenal at Wembley, two games for which I had no chance of obtaining tickets. The loss to Arsenal really did signal the start of our decline. On the face of it things should have been quite good, We had won the League Championship only three years before and we had got to the FA Cup Final but the truth was that we were on the slide. We had achieved our success with an ageing team although this was a problem for all clubs as football came to terms with the end of the war. 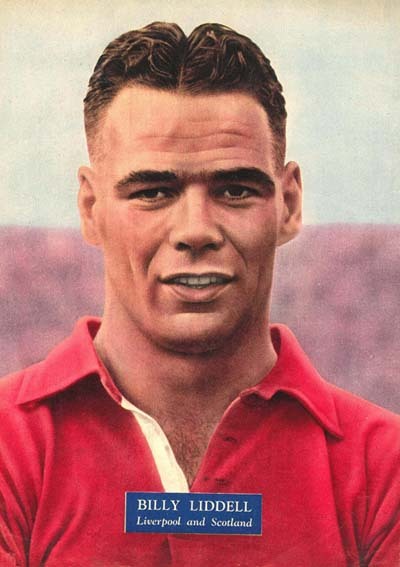 In a funny sort of way you could say that Billy Liddell was the cause of Liverpool’s demise because we expected so much from him that we didn’t have to buy any other players!! The reality was, of course, different. We badly needed new players and the ones that were signed by George Kay, in his later years, by Don Welsh and later by Phil Taylor were, frankly, not good enough. Our years in the second division were miserable except for the contribution of Billy, who gave everything (and more). He would have been well within his rights to have asked for a transfer to enable him to play in the top division but that wasn’t Billy’s way. Although a Scot, he was truly an adopted scouser and he devoted the rest of his career to the vain pursuit of getting Liverpool back into the First Division. At times his displays bordered on the superhuman. 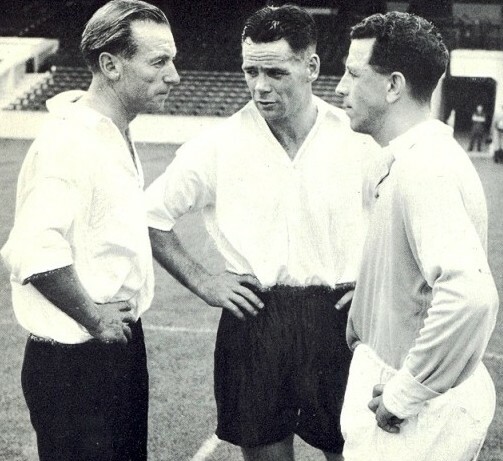 Liddell flanked by the great Stanley Matthews on the left and Manchester City legend Roy Paul preparing for the match between Great Britain and the Rest of Europe in Belfast 1955. He had been selected to play in the first ever Great Britain team against the Rest of Europe at Hampden Park in 1947 and, although he didn’t score, he was instrumental in Great Britain’s 6-1 victory in front of 135,000 spectators. 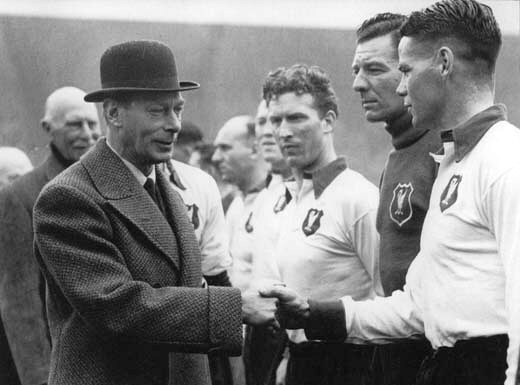 Eight years later another Great Britain v Rest of Europe fixture was arranged to celebrate the 75th anniversary of the Irish FA. The game took place at Windsor Park, Belfast and Billy was one of only two players selected who had played in the first game (the other was Stanley Matthews). This time the result was different, Europe winning 4-1 but Billy was always justifiably proud of being selected for both games. Throughout the dark days of the second division he never gave less than his best and his forays down both wings and, later in his career, his battering ram performances as centre forward gave us hope that we would rise again. It would not happen during his playing career but he was able to retire knowing that he had done more than any player could possibly be expected to have done and he spent his retirement sitting just in front of me in the Main Stand watching his successors taking the team on to glories that would not have been possible without his massive contribution. In my opinion Billy was the greatest player ever to pull on a red shirt. "Billy Liddell was a giant of a man and match winner on his own right. Very strong person."